The present study set out to elucidate the structure and function of the large subcuticular air sacs encountered in the gaster of the Oriental hornet Vespa orientalis (Hymenoptera, Vespinae). Gastral segments I, II, III, together with the anterior portion of segment IV, comprise the greater volume of the gaster, and inside them, beneath the cuticle, are contained not only structures that extend throughout their entire length, like the alimentary canal, and the nerve cord with its paired abdominal ganglia, situated near the cuticle in the ventral side, but also the heart, which is actually a muscular and dorsally located blood vessel that pumps blood anteriorly, toward the head of the hornet. The mentioned structures take up only a small volume of the gaster, while the rest is occupied by air sacs and tracheal ducts that also extend longitudinally. Interposed between the two air sacs, there is a hard partition and above it, at the center – a paired tracheal duct that extends the entire length of the air sacs. The endothelium of the air sacs is very anfractuous, thereby enlarging and strengthening the surface area. In each gastral segment there is an aperture for the entry of air, namely, a spiracle. Additionally, in each segment, in the antero-lateral aspect of its tergum and situated between two successive segments, there is an intersegmental conjunctive bearing parallel slits of 1–2 microM in width and 10–30 microM in length. The latter are arranged concentrically around bundles of tracheae that traverse the cuticle from segment to segment. From the upper rims of the slits are suspended downward fringe-like structures or "shutters" ranging between 3–10 microM in length. We discuss the possibility that the Oriental hornet resorts to internal circulation of air, along with a thermoelectric heat pump mechanism, in order to achieve cooling and thermoregulation of its body. 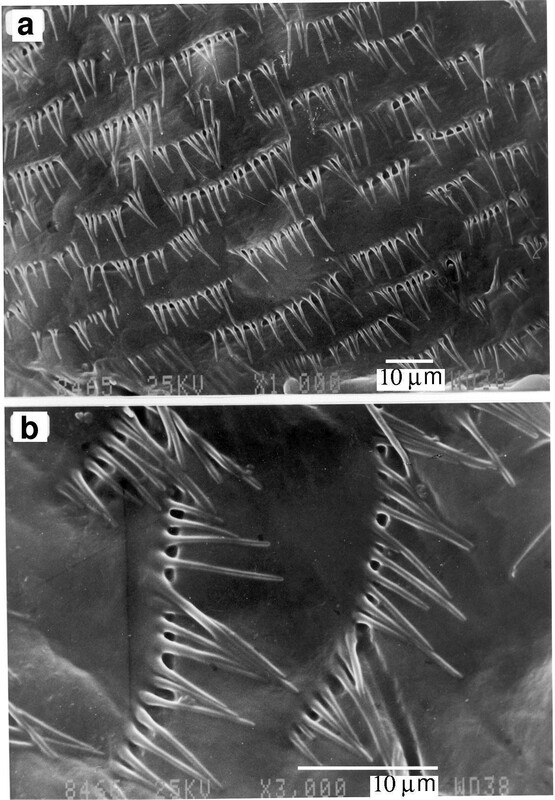 In previous investigations, efforts were made by us to elucidate the structure and mode of functioning of the cuticle in the gastral region of the Oriental hornet. We were ultimately able to describe in the hornet cuticle the presence of a solar cell unit , the ultrastructure of a unit called a peripheral photoreceptor , the sub-micromorphology of the epicuticle in the gastral segments , and the layers making up the yellow and brown stripes in the gastral cuticle , with their typical specific heat. Additionally, we measured electric voltages and currents in the cuticle of live hornets and found them to be in the range of 300–400 mVolts and 1–5 μAmperes (Pertsis et al., in prep.). In the course of the above studies we noticed that in hornets flying on a hot day there was a marked difference in temperature between the gaster and the thorax . Our interest in this incidental finding increased further when we also observed that the gastral cuticle temperature was by about 3°C lower than the ambient temperature – an observation that merited explanation. We knew, of course, that mammals are capable of reducing their body temperature below that of the environment, and this through the evaporation of water by perspiration. However, insects do not perspire, nor do flying insects such as hornets normally lose water by evaporation in the course of their flight. Thus our observation could not be explained by invoking evaporation. There have long been reports in the literature regarding insects having a lower temperature in their gaster than in their thorax, but this was attributed to a differential flow of haemolymph from the dorsum of the gaster (the neurogenic heart) toward the thorax [6, 7]. As for hornets (and wasps), they are predatory, annual, social insects in which each colony consists of a single family with one fertile female (the queen), then numerous workers, and finally drones and young queens that make their appearance in the fall [8–10]. Hornets belong to the sub-family Vespinae and, in total, comprise about 60 species; their structure is fairly uniform in that they all have an elongated abdomen which is separated from the thorax by a narrow stalk-like part – the hornet waist. We need to point out that in hornets the abdomen is called a gaster, because the first segment of the abdomen conjoins during the pupal stage with the three segments of the thorax and it is the remaining segments which actually comprise the gaster. Furthermore, the first two segments of the gaster in the Oriental hornet possess a brown pigment, the next two segments are each part brown and part yellow, and the two terminal segments comprising the tip of the gaster are both brown in color. For respiration purposes, hornets of genus Vespa possess a pair of air openings – the spiracles – in the last two segments of the thorax, in the propodeum (i.e., the abdominal segment which conflated with the thorax), and in each of the visible segments of the gaster (6 in females and 7 in males). These spiracles lead into tracheal air sacs. The latter have already been described in detail by Snodgrass  for the cicadan species Magicicada septendecim, where they occupy most of the abdominal volume and connect to the exterior via the first abdominal spiracles. Grassé  mentions, inter alia, the presence of air sacs in the fly genus Musca (Diptera), in the Hymenopteran genera Apis and Bombus, and in the wingless worker ants (Hymenoptera). As described, these (tracheal) air sacs are flexible and devoid of taenidia on their inner surface, which enables their easy expansion and contraction in the course of respiration. Wigglesworth  enumerates the functions served by air sacs in insects, pointing out that air sacs have low weight and occupy a large volume, which in the pupal stage is filled with haemolymph (which is heavy in comparison), and this haemolymph is retained also in the imago, (albeit comprising only a third of its volume in the pupa) where it proves much more effective in transporting sugar(s) to the tissues. Needless to point out that, as far as flying insects are concerned, air sacs will assist flying by reducing the weight. In the present study, we focused on the internal structure of the gaster, that is, the part beneath the cuticle, and its possible contribution, together with the air sacs and spiracles, to thermoregulation in hornets which enables the latter to function also under extreme (hot) climatic conditions. Live hornets, mainly adult workers, were collected from the field, during the summer, in the Tel Aviv metropolitan area, as previously described . Preparation of vespan specimens for viewing via light and scanning electron microscopes was also done as previously described . Invariably at least 10 hornets or parts of them were used in each experiment or observation. We exhibit pictures obtained using light microscopy (LM; figure 1), Magnetic Resonance Imaging (MRI; figure 2), and scanning electron microscopy (SEM; figures 3,4,5). Pictures taken through a light microscope (LM). At top left – entire, intact hornet. At top right – hornet in dorsal aspect, with the cuticle of its tergites removed from the first three segments of the gaster. One can see two empty spaces (formerly housing two air sacs) and between them – a hard partition – the mediastinum (M) that ends with a diaphragm (D). Only in the terminal third-quarter of the gaster, beyond the walls of the air sacs, do internal organs fully occupy all available space. At bottom left, showing hornet in dorsal aspect, we have retained a strip of cuticle but where the cuticle has been removed (arrows), one can see the white wall of the air sacs. At bottom right, the right half of the gaster has been removed by scissors, leaving only the partition separating between the two air sacs (i.e., the mediastinum) and also the left air sac. For details see Results section. An MRI view of the hornet with details of its gaster is presented. A sagittal slice (top picture) and four axial slices (a – d) of different hornets. The dotted white lines in the sagittal image suggest the anatomical location and orientation of each axial slice. The theoretical resolution in the MRI images can be obtained by dividing the field of view (FOV) by the number of matrix elements. This yields 35 μm for the resolution of the axial images and 88 μm for that of the sagittal images. Any organs or tissue elements whose size or typical pattern is smaller (such as small tracheae), will not appear in the image, and its signal contribution will be averaged with those of other small nearby elements. Such a tissue element will be presented in the image by the typical gray scale level of this average, rather than by any fine structure. It is emphasized that this loss of information does not result in a loss of signal, but in a non-resolved dispersion of the fine-structured signal. However, the black areas in the image (which correspond to zero signal intensity) can only be the result of a near-zero concentration of water spins, i.e. air-spaces within the body of the hornet or the MRI-transparent liquid that surrounds this body. Transverse (horizontal) section through gastral segments 1–4, photographed using SEM. Fig. a, a cross section through the crop (C) and a transparent membrane of the air sac (TM). Tracheal ducts (TD) are visible. Bar = 1 mm. Fig. b, a section through an air sac (AS) and one trachea extending almost across the entire picture (TR) is visible. Bar = 1 mm. Fig. c, the morphology of the endothelium (EN); Bar = 1 μm. Fig. d, the intima of an air sac. Bar = 1 μm. Fig. e, the outside of the air sacs with numerous thick tracheae. Bar = 100 μm. Fig. f, numerous tracheae are seen at the end of the air sacs. Bar = 10 μm. Figs. a–e were photographed using SEM; Fig. f is a schematic drawing. Fig. a, the view outside the air sacs and the aperture (AP) of large trachea. Bar = 100 μm. Fig. b, large trachea (TR) emerging from an air sac. Bar = 100 μm. Fig. c, the intersegmental conjunctive (IC), i.e the membrane which overlies part of the next segment, which starts underneath it. HY indicates the hypocuticle. Bar = 100 μm. Fig. d, enlargement of the braid of tracheae, which pass to the intersegmental conjunctive (IC of Fig. c). TRB tracheal branches, EP = epithel covering the braid of tracheae, TS = transverse stripes. Bar = 100 μm. Fig. e, details of the peripheral photoreceptors (PP's) in the yellow region of the gastral segments. The PP's are evident, each of them surrounded by a branch of a trachea (TR). Bar = 1 μm. Fig. f, scheme of the main structures featured in the previous parts of this plate: The general configuration fits that of the picture in Fig. c. One can see that a yellow stripe from the gaster of a hornet on its interior surface (1) has on its brown side tracheae connecting to the preceding segments (2) and also tracheal connections to the exterior (3), as well as one (or two) large air sac/s in the segment (4) from which emerge braids of tracheae to the IC region (5), where they split into thinner tracheae (6); the latter pass into the PP (7). Thin layers of cuticle seal the PP from underneath, but the layers are rather transparent and thin (8). In this region there is yellow pigment around the PP (9) and numerous cuticular layers extending towards the exterior (10), as well as a layer of epicuticle (11). 'A' indicates the upper part of the cuticle, where each PP has a light-admitting canal which is blocked only by a thin layer of epicuticle (11). The inner layer of the cuticle is the hypocuticle (12). Fig. a, the slits and their filliform "shutters" (FS) arranged concentrically around the epithelium that envelops the tracheal braid. Bar = 10 μm. Fig. b, an enlarged portion of Fig. a. Bar = 10 μm. In Magnetic Resonance Imaging (MRI), the magnetic spins of Hydrogen nuclei (i.e., protons) in water molecules within biological tissue are excited, after which their decay signals are collected and spatially reconstructed so as to yield an image of the tissue. The magnetic spins are excited in slices of finite width, and for each slice, a single image is obtained. The relative intensity of each element of the image depends on the combined effect of the water concentration and spin relaxation times (the rates at which the spins lose their magnetic energy and magnetic coherence). Thus various tissue types exhibit a variety of signal intensities (contrast) due to differences in water concentration and relaxation times among tissues. Imaging experiments were performed on a Bruker AVANCE 360 WB spectrometer, using a micro-imaging probe. Experimental procedures were carried out in compliance with the guidelines of the Tel Aviv University Institutional Animal Care and Use Committee. The samples were immersed in Flourinert (FC-77, Sigma, USA) – an MRI transparent liquid- and placed in a 10 mm tube at approximately 22°C. For both the sagittal and axial images, spin echo sequences were utilized, where both excitation and refocusing pulses were 2 ms long. The slice thickness was 0.5 mm and multiple slices were obtained in an interlaced manner. Size of the digital image was 256 × 256 pixels, and 32 acquisitions were averaged for improving the S/N (signal-to-noise) ratio. For the sagittal images, TR = 4 s (this is the time delay between subsequent excitation pulses), TE = 12.74 ms (this is the time to echo), FOV = 22.5 mm (this is the field of view), the total experimental time was 9:07 hours. For the axial images, TR = 5 s, TE = 7.73 ms, FOV = 9 mm, the total experimental time was 11:23 hours. At the beginning of the hornets' active season in Israel (April-May), the few worker hornets already present in the incipient nest frequently and agilely fly out of the nest, whereas the founding mother queen takes to flight only rarely and rather clumsily . Throughout the active season, most hornet flights take place during midday hours, while before and after that time the flight activities are reduced by a factor between 10 and 100. In one experiment, we captured worker hornets flying to or from the nest, subjected them to ether anaesthesia, and then measured their entire length as well as the length of the gaster and the length of the head + thorax. We also weighed these same body parts. In 30 of these workers, whose mean total length was 20 mm, the mean gaster length was 12 mm and that of the head + thorax was 8 mm, while gaster weight was 106 mg on average, and that of the head + thorax was 157 mg on average. The mean overall weight of a worker hornet was thus 263 mg. From weighing the worker hornets, and from their length measurements, it is clear that the gaster is about 50% longer than all the other body parts combined (i.e., the head and thorax), yet weight of the gaster is only about two thirds the weight of the rest of the body. Thus, in the Oriental hornet, the gaster represents a relatively large volume but a rather light weight. Figure 1 exhibits photographs taken with visible light microscope, The picture at top left shows a complete Oriental hornet worker. The other photographs in this figure show dissected worker hornets. 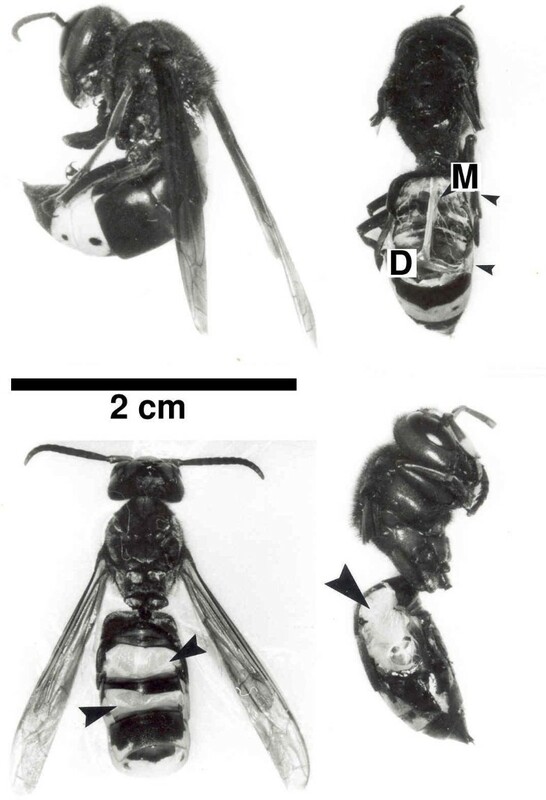 The picture at top right shows a worker hornet in which the dorsal portion of the gaster was removed, displaying no internal organs. The two unmarked arrows indicate where two air sacs were present before the dissection. Also indicated, by the arrow marked M, is a mediastinum, along with some interconnecting tracheae. The mediastinum divides the gaster volume into two regions: It is a partition that extends from the floor of the gaster, which includes the sternal plates, the ventral ganglia and the crop (see below), up to tergal plates that probably enable – in the space between the cuticle and the partition – the pumping activities of the heart (which is located dorsally in this region). The observed partition extends along the gastral segments 1–3 and also part of segment 4. D indicates the hornet's diaphragm, which is a flat membrane lying perpendicular to the mediastinum at its distal end. The picture at lower left shows the air sacs from a ventral aspect, (arrows) after removal of cuticle strips. Note that some strips of cuticle have been left in situ in order to preserve the contours of the air sacs, thus parts of those sacs are hidden from view. Nevertheless, one clearly notes that the air sacs occupy most of the gaster volume. The bottom right photo shows a hornet in which the right side of the gaster has been removed, exposing to clear view the partition which separates between the air sacs on the left and on the right sides of the gaster (see arrow). In order to elucidate the structure of the Oriental hornet's gaster we resorted to micrographs obtained via MRI. In Figure 2 at the top we see an image of a hornet, actually a sagittal section of the head (H) and thorax (TH) (on the left) and below it – axial sections of same. Proceeding distally, we have the gaster (G and curved lines) looking like a hollow portion – actually these are the air sacs. Next we see the crop [indicated by (a)] and then another hollow region (b), which, later on, displaces the air sacs toward the posterior part of the gaster (c), namely, from the end of gastral segment 4 through segments 5 and 6. Further on we see area (d), which contains the two blocked air sacs and the diaphragm. Beyond the latter are concentrated the respiratory muscles, the venom sac, [the bright oval mass at the center of section (d) in the upper image] and the stinger mechanism, as well as the intestine and the genitalia. The sections marked (a – d) in the top image are exhibited as Figs. 2a,b,c,d in the lower images. Fig. 2a (middle images, left) shows the mediastinum (M), which separates between the left and right air-sacs, and the crop at the bottom (C). Fig. 2b shows the lower part of the mediastinum and the air sacs in this region of the abdomen. In Fig. 2c (lower side, left) the left side is still in the air sac of the abdomen, while right side of the air sac is already blocked by the diaphragm membrane D. In Fig. 2d that membrane (D) already closes both air sacs. Figure 3 (obtained using SEM) shows a transverse-horizontal section through gastral segments 1–4. In Fig. 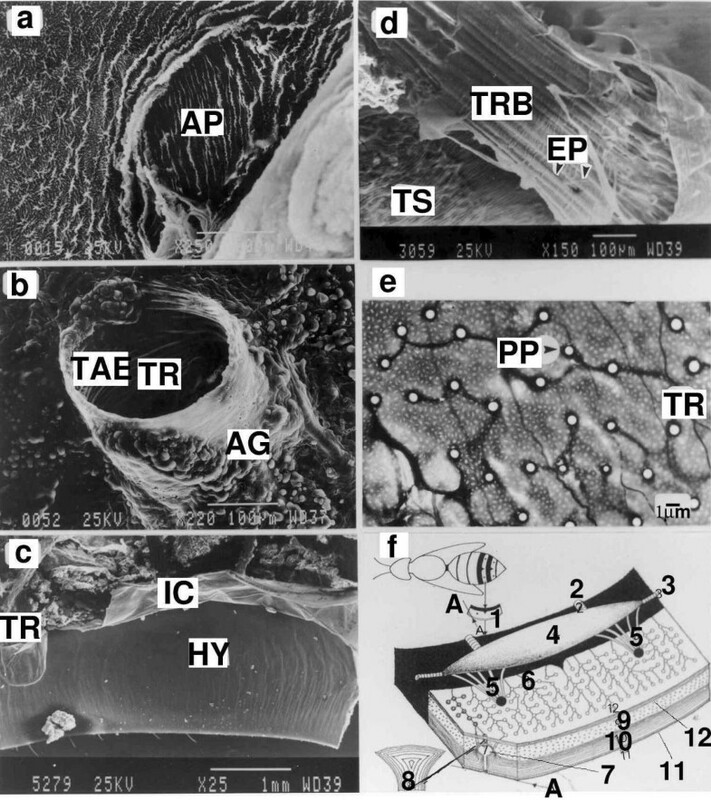 3a of this figure we see at bottom center a section through the muscular crop (C), and at right center – a transparent membrane of the air sac (TM). On top left and right are visible tracheal ducts (TD), which extend upwards (in reality, distally) in the picture. In Fig. 3b we can see that the section (incision) passed through an air sac (AS) (at center of picture). At the bottom of the air sac is visible a single trachea (TR), which stretches horizontally. In real life, pairs of such tracheae are located above the air sacs (but below the cuticle). Fig. 3c provides a picture of the inside of an air sac taken at high magnification (×8000). The endothelium (intima) (EN) here is anfractuous and reinforced by folds that enlarge the surface area but is not annulated as in the large tracheoles. Fig. 3d also shows the intima in an air sac near to the previous one, but at ×7000. In Fig. 3e we see an area outside the air sacs displaying numerous thick tracheae, indicated by arrows, which are up to about 50 μm in diameter (on right of picture), but also thin and winding tracheae. Fig. 3f was taken from a location more proximal than in the previous figure, and here we see numerous tracheae, most of which are 10 μm or more in diameter and some of which are forked (×500); the 'dust' which masks the surface and is marked by arrows is probably condensations of haemolymph that has frozen in the course of preparation for photography. Figure 4 offers SEM views of structures present mainly outside the air sacs. In Fig. 4a we can see an air sac with an aperture (AP) through which a trachea has emerged; it is clearly evident that both the inner and outer membranes of the air sac are amenable to contraction and expansion (depending on the air pressure inside). Fig. 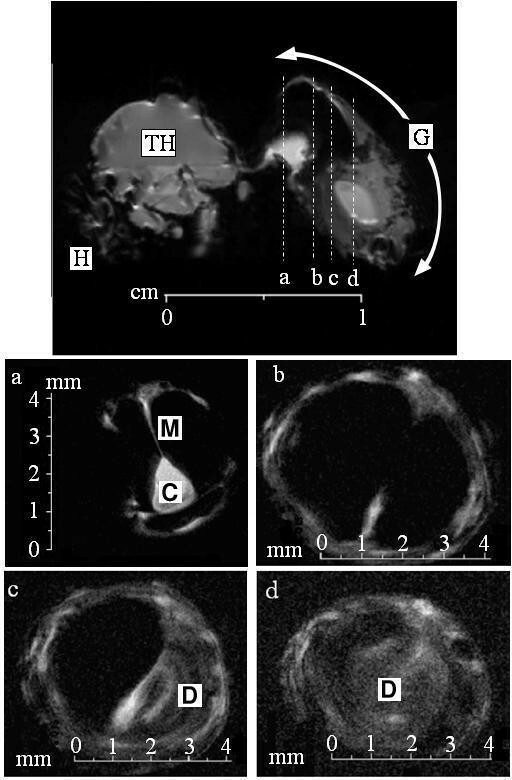 4b shows a large trachea (TR) (about 200 μm in diameter) which has emerged from an air sac; both on the outer wall of the air sac, and subsequently also on the outer wall of the trachea, one can see aggregates of mound-shaped projections (AG), probably containing fat cells; within the trachea are discernible support rings (taenidia – TAE) that ensure incollapsibility of the trachea. Fig. 4C provides a bottom view of that part of the cuticle (yellow) which overlies the next segment, which commences underneath it. This area of the cuticle is sealed by a membrane – the hypocuticle (HY). The membrane which overlies this part of the cuticle is called the intersegmental conjunctive (IC). At left of the picture, we can see the insertion of tracheae (TR) into the cuticle beneath the IC. At every site where there is such 'doubling' of the cuticle we see two 'braids' of tracheae emanating from the air sac into the IC (not seen in this picture). Fig. 4d offers greater magnification of such a tracheal braid (TRB) (actually in the picture there are about 15 of these parallel tracheae) which pass from the air sac into the intersegmental cuticle (see IC in Fig. 4c), beneath the epithelium (EP) seen in the picture; this epithelium is intact only at its base and even there one can see that it is made up of transverse stripes (TS) – these are narrow threads. Some of them are also evident on the right side of Fig. 4d, where they run perpedicular to the parallel tracheae. 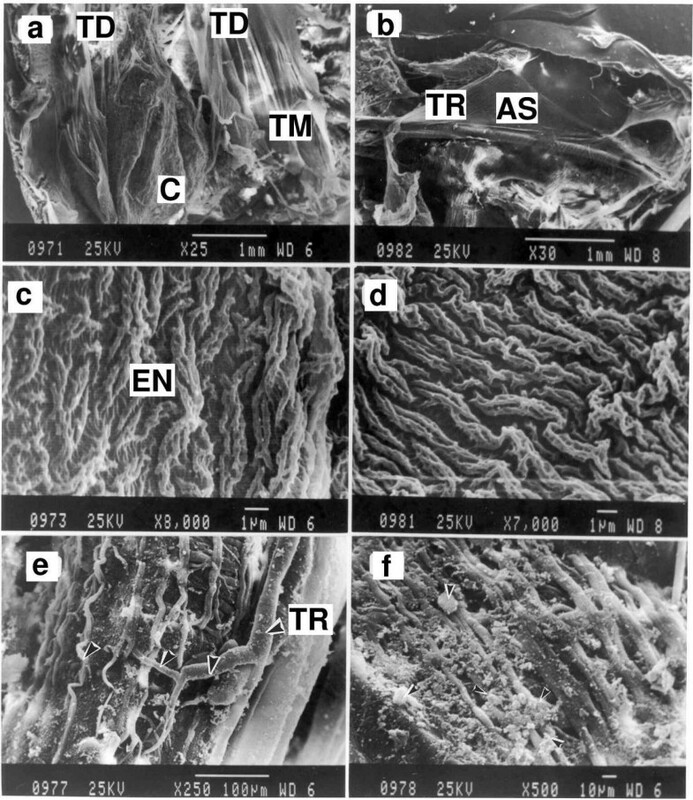 The epithelium here seals up the gastral-abdominal space (see the enlargements in Figure 5). Fig. 4e shows how, when one gently peels off the membrane overlying the region (i.e. when one removes the basement membrane and the hypocuticle), one can see from this (internal) aspect, the bright circles representing the peripheral photoreceptors (PP indicated by arrow), which are numerous and interconnected by the tracheal branches (TR). A scheme of the main structures featured in Figure 4 is given in Fig. 4f. Note that the general configuration fits the picture in Fig. 4c. One can see that a yellow stripe from the gaster of a hornet on its interior surface (1) has on its brown side tracheae connecting to the preceding segments (2) and also tracheal connections to the exterior (3), as well as one (or two) large air sac/s in the segment (4) from which emerge braids of tracheae to the IC region (5), where they split into thinner tracheae (6); the latter pass into the PP (7), supply them with oxygen and probably also cool them. Thin layers of cuticle seal the PP from underneath, but the layers are rather transparent and thin (8). In this region there is yellow pigment around the PP (9) and numerous cuticular layers extending towards the exterior (10), as well as a layer of epicuticle (11). In Fig. 4f, 'A' indicates the upper part of the cuticle, where each PP has a light-admitting canal which is blocked only by a thin layer of epicuticle (11). The hypocuticle (12) is found on the inner side of the cuticle. In Figure 5, we note that the top picture (Fig. 5a) is an enlargement of Fig. 4d of Fig. 4, that is, an enlargement of the epithelium that envelops the tracheal braid that passes from the air sac in the gaster to the periphery of the cuticular yellow stripe. One can note that, at intervals of about 10 μm in the epithelium, there are orifices in the shape of narrow slits measuring about 1.3 μm in width. Attached from the upper lip of each slit are filliform "shutters" (FS) that hang down the entire length of the slit, which ranges between 10–20 μm. The length of these FS is quite variable, in fact, each differing in length from its neighbors and ranging widely between 0.6 – 10 μm, while the distance from one to another is about 3 μm. All the slits are arranged concentrically around the epithelium that envelops the tracheal braid. As for the FS, they are a few tenths of one μm in diameter, but are somewhat broader at their bases which are situated on the upper rim of the slit and sharpen at their distal tip. An enlargement of the slits and their FS is shown in the bottom picture (Fig. 5b). We are tempted to speculate that the bases of these FS serve as quasi-shutters that may, to some extent, block the flow of air outwards, while their filliform stems perhaps incorporate physical sensors for gauging the flow velocity or the temperature and humidity level of the flowing air. We stress that currently there is no evidence to support the latter speculation, beyond the observation that these stems seem to be longer than is necessary just for regulation of air flow. As shown in the results section, the hornets' gaster has a large volume and surface but a relatively light weight. The reason for this becomes clear when we inspect the contents of the gaster (Figure 1), for then we find that the part of the gaster with the greatest volume, namely, segments 1, 2, 3, and a portion of segment 4, contains, in addition to vital organs such as the crop and the continuation of the intestine in a ventral orientation and the tubular heart in a dorsal one, also – and significantly volumewise – the two large air sacs and tracheae emerging from them. It is only the terminal part of the gaster, comprising 1/4-1/3 of the total gastral length and less so of the total volume, which contains most of the small and large intestine, the genitalia (degenerated ovaries in 'sterile' flying worker ), the venom apparatus, the Malpighian tubules and, of course, respiratory muscles. The presence of the air sacs in the major volume of the gaster is visible in Figure 1 in dorsal, ventral and lateral aspects, and also in Figure 2 in sagittal and axial views. Both plates evince the fact that the greater volume of the gaster is occupied by the air sacs and that these sacs are separated at the medial line by a hard partition (the mediastinum) which safeguards against collapse of the sac walls and thereby ensures retention of a fixed, minimal volume and is blocked at the end of the two sacs by a diaphragm – like partition. Any changes in volume, that is, in the internal pressure, are dependent on a pumping mechanism, the intensity of the air pumping and its expulsion, and the rate and direction of such air expulsion. As can be seen in Figure 3 Figs. 3a and 3b, the walls of the air sacs appear simple, i.e., devoid of taenidia, albeit endowed with numerous folds and branches in various parts (Figs. 3c, 3d). The latter folds and branches apparently reinforce the sac walls and also lend them maximal flexibility, thereby enabling them to increase or decrease the volume of the air sac. So far as could be discerned at this stage of the study, tracheae of various diameters emerge from the air sac, but because of their minute size, they do not show up in the MRI. In Figure 4: Fig. 4d offers a greater magnification of the tracheal bundle, which is enwrapped in external epithelium as a continuation of the IC in Fig. 4c. In this region, the epithelium is seen to have narrow slits, arranged intermittently and seen in greater magnification in Figure 5. Closer inspection of these slits, that probably allow expulsion of air from the gastral segments, reveals that above each slit there is a row of curtain-like appendages. We suggest that these appendages, which arch around the tracheal bundle that passes from one segment to next, could serve in any of the following roles, namely: to regulate the exit of air, to gauge the air pressure, to gauge the humidity, to gauge the temperature and/or to detect infra red (IR) radiation. The variable length of these appendages, which we have chosen to call filliform "shutters" (FS), could be accidental but then, again, this differential feature could be of special importance for their possible function as physical sensors. Whichever the case, we presume that the air entering through the spiracles leaves (under pressure) through the slits in these membranes, so that during breathing under exertion, such as occurs in the course of hornet flight, and especially flight at relatively high temperatures, these slits could perform some important tasks. Organs sensitive to IR have been described in various living organisms. Thus the beetle Melanophila acuminata is capable of detecting forest fires from distances as far away as 100–150 km and the sensors involved are two IR-detecting pit organs located on either side of its thorax near its middle legs [18–22]. Organs for IR detection, somewhat similar morphologically to those shown by us in Figure 5, have been reported in vertebrates. Thus, for instance, the pit organs of Crotaline and Boid snake are radiant heat detectors [23–25]. In Fig. 4e, we have an SEM micrograph of peripheral photoreceptors (PP's) with each surrounded by a branch of a trachea. Tracheal branches in fact pass between all the PPs and on a warm summer day, their function is perhaps to cool the PPs by airflow and maintain them at a uniform, low temperature. Fig. 4f displays branching of the air containers from tracheae that can pump air in and out of the air sacs and thence to the more delicate tracheoles, which ultimately connect to the hundreds of PPs located beneath the exterior of the hornet. In a previous report  it was noted, with regard to hornets subjected to ether anaesthesia, that their body temperature was fairly uniform and lower than that of their immediate environment in the nest. By contrast, in a wakeful hornet at night the temperature of the head and thorax is 33.7°C, while that of the gaster is 26.7°C, that is, lower by 7°C. As for hornet workers standing guard at the nest portal at night, their gastral temperature is still higher by about 3.7°C from that of the environment in which they patrol. In another report, a worker tracked in daytime flight from the field toward the nest, and photographed in IR light, exhibited a temperature of 34°C for the head and thorax, and 28°C for the gaster, while the ambient temperature was 30°C . In other words, the thermal discrepancy between the head-thorax and the gaster was somewhat smaller, but while at night the temperature throughout the hornet's body is greater than the ambient temperature, in the daytime, the temperature of the head and thorax is higher than ambient, but that of the gaster is lower than the ambient temperature. How does one explain the thermal disparity between one bodily part and another in hornets? How does the hornet attain a body temperature lower than the ambient one? What is the significance, importance or teleology of these findings? With respect to the first two questions, we note that previous reports of temperature differences among different body parts of insects include observations on honeybees . In that case, the head and thorax were observed to be a few degrees below the gaster temperature. Similar differences were also reported in other insect groups. Various explanations were offered for those observations: Honeybees were hypothesized to regurgitate a fluid droplet using their tongue during flight, i.e., when this behavior cannot be easily verified. The evaporation of water from such a droplet between its recurring emission and re-ingestion ("repeated regurgitation") was thought to be capable of cooling the head by 2°C and the thorax by 0.5°C with respect to the surrounding air . The role of haemolymph flow in temperature regulation is generally recognized. Also recognized is the fact that, during extended flight, thoracic muscles generate heat which makes the thorax warmer than the abdomen. The heat radiated from the thoraci of honeybee nest inhabitants is what keeps the beehive at a relatively fixed temperature of about 35°C . We have recently made the revolutionary suggestion that the hornet cuticle can activate a thermoelectric heat pump intermittently in order to move heat in a direction perpendicular to its surface . This was deemed necessary in order to achieve a body temperature that is lower than that of the surroundings. If that mechanism is available, then it can also be used to raise the body temperature above that of the surroundings by simply reversing the direction of the electric current which powers the heat pump. In fact, the direction of heat pumping could be different in different segments of the cuticle – outward in the abdominal segments, but inward in the thoracic segments. It should be stressed that, while it can do the job of heating up the body, the heat pump mechanism is not the only way to achieve that goal. Conventional biochemical metabolism can also do that. By contrast, sustained cooling of the body to below the surrounding temperature can only be achieved either by evaporation, which is ruled out due to lack of moisture on the exterior surface, or by a heat pump. In answer to the third question, we would like to examine the idea that the hornet exploits the regulated flow of air through its tracheae as an additional mechanism for thermoregulation. It is of course well known that higher organisms exploit blood flow through long and narrow blood vessels in order to efficiently move heat among different parts of the body, allowing those creatures to maintain a high uniformity of body temperature. In insects a similar role might be played by haemolymph. An important factor which contributes to the efficacy of blood and haemolymph as carriers of heat is their large heat capacity, similar to that of pure water. By contrast, a factor which detracts from that efficacy is the viscosity of those fluids, which is even larger in blood (and haemolymph) than in water due to the particles suspended in it and the macromolecules dissolved in it. Comparing air to water-like fluids, as a carrier of heat, we note that it has a much lower heat capacity, but also a much lower viscosity. The rate of heat transport Jq, by fluid flow through a channel whose length is much greater than its lateral dimensions, is proportional to the heat capacity per unit volume Cv and inversely proportional to the viscosity Η. Since Cv(water) / Cv(air) 4500 while Η(water) / Η(air) 60, we get Jq(water) / Jq(air) 75. Blood and haemolymph have higher viscosities than water. (They also exhibit significant non-Newtonian behavior, but we will ignore this complication.) Therefore the viscosity ratio of these fluids to air will be greater than 60, and their heat transport ratio to that of air will be less than 75, i.e., the advantages of these fluids for heat transport, as compared with air flowing through the tracheae, will be less overwhelming than those of pure water. Nevertheless, we still expect that the same qualitative conclusions will be valid. The fact that blood and haemolymph flow is more efficient for transporting heat than air flow explains why non-airborne creatures exploit those fluids in preference to air for that purpose. Nevertheless, for flying creatures, such as hornets, air has the big advantage that its density is about 750 times smaller than that of water. Therefore the amount of air, required to achieve a rate of heat transport similar to that of water, has a volume that is 75 times greater but weighs 10 times less. Clearly, when haemolymph is considered versus air, instead of water versus air, this relative advantage of air becomes even more significant. It is also interesting to note that for fluid flow through a small hole like the slits in the air sacs, i.e., a channel whose length is much smaller than its lateral dimensions, the rate of heat transport Jq is again proportional to Cv, but instead of depending on the viscosity Η, it is inversely proportional to the square root of the mass density . Since ρ(water) / ρ(air) 750, we get Jq(water) / Jq(air) ≅ 160. Again, although water-like fluids are more efficient than air by the large factor 160, the mass of air which must be moved in order to transport a given amount of heat is 5 times less than the mass of water which would have to be moved in order to transport the same amount of heat. Another advantage of air over haemolymph is the fact that it does not need to be recycled: After its heat content has been extracted, it can be released from the hornet's body. New air at ambient temperature can always be ingested, whenever needed, from the outside. In the case of blood or haemolymph this is impossible, therefore the living creature must carry around with it permanently the entire quantity that it needs for heat transport or for other purposes. We note that the flow rate, and hence also the rate of heat transport Jq, is proportional to the pressure head along a long trachea or across the small depth of a slit or orifice, irrespective of the type of fluid under consideration, as long as that fluid is Newtonian in character. It is only the proportionality coefficients that depend on the linear dimensions of the flow. These coefficients also vary from fluid to fluid, depending on its specific properties (viscosity, heat capacity per unit volume, mass density). The pressure head is presumably produced by a complicated sequence of muscle contractions, and is not directly dependent on the precise nature of those fluids. That is why it is irrelevant for a consideration of the relative merits of those fluids. Heinrich  has remarked that in the case of a high ambient temperature, the abdomen of a bumblebee expands, drawing air through the spiracles into the abdominal air sacs. In the dragonfly Anax junius (Odonata), body cooling is thought to be achieved "by increasing the circulation of haemolymph to the abdomen at high air temperature, thus facilitating heat loss from the thorax" . Prange  remarks that "in certain species of grasshoppers the depression of internal temperature appears to be caused by increased tracheal ventilation for evaporative cooling", while Miller  notes that certain types of dragonflies clap their wings, and that "this behavior may serve both respiratory and thermoregulatory functions, the latter by circulating air internally and externally". It is important to note that none of those discussions is able to cope with the observation, reported in Ref. , that it is the abdomen of the Oriental hornet which is cooler than the surrounding air after a long foraging flight on a hot day. Only a combination of heat pump cooling through the abdominal cuticular shell, combined with heat transport by air flow, seems capable of explaining the latter observations. Our suggestion that flow of air through the hornet's body is a major factor in its thermoregulation is not proven by our results, or by the subsequent discussion. However, we hope we have shown that such a role for internal air flow is not out of the question, and is, in fact, supported by a considerable amount of circumstantial evidence and physical estimates of flow rates and cooling rates. In order to study these ideas further, we will need to measure the flow of air in and out of the air sacs through the slits in their envelope, as well as through the tracheae which connect different parts of the hornet body. This work forms part of a PhD thesis of Vitaly Pertsis, to be submitted to the Tel Aviv University Senate. Partial support for this research was provided by the US-Israel Binational Science Foundation and by the Israel Science Foundation.